, 1916–2009, U.S. secretary of defense (1961–68), b. San Francisco, grad Univ. of California, Berkeley (B.A., 1937), Harvard (M.B.A., 1939). 1931–, American political activist, b. Chicago, grad. Columbia Univ. (B.S., 1952, Ph.D., 1959). After serving in the U.S. Marine Corps, he worked for the Rand Corporation (1959–64; 1967–70), conducting studies on defense policies. ..... Click the link for more information. , a former government employee who made the Pentagon Papers available to the New York Times, and Anthony J. Russo on charges of espionage, theft, and conspiracy. On May 11, 1973, a federal court judge dismissed all charges against them because of improper government conduct. See the New York Times ed., The Pentagon Papers (1971); S. J. Ungar, The Papers and the Papers (1972); D. Rudenstine, The Day the Presses Stopped (1997). 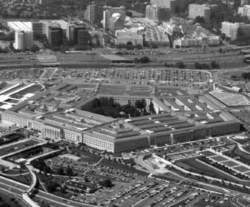 An aerial view of the Pentagon in Washington, D.C. When the “Pentagon Papers” were leaked in 1971, detailing the United States’ involvement in Vietnam from 1945 to that year, President Nixon denied knowledge of their contents. The Pentagon Papers, with their revelations of the vast litany of lies that the U.S. Department of Defense and the president issued to the American people about Vietnam, probably did more than any single factor in the past fifty years to create distrust in the government. On June 13, 1971, President Richard M. Nixon opened up his Sunday New York Times to see a picture of his daughter Tricia and himself from her wedding in the White House Rose Garden. Next to the photograph, on the right, was the headline over Neil Sheehan’s initial story on the Pentagon Papers, “Vietnam Archive: Pentagon Study Traces 3 Decades of Growing U.S. Involvement.” Nixon would maintain that he never read the article, but he told Secretary of State Henry Kissinger later that day that certain people had to be “put to the torch” and jailed for leaking such information to the press. The Pentagon Papers constitute a massive seven-thousand-page, above-top-secret Defense Department history of America’s involvement in the Vietnam War from 1945 to 1971. This historic document, leaked to the press by Daniel Ellsberg, a Defense Department staff member, has probably done as much as any single factor in the past fifty years to create distrust of the machinations of the U.S. government by its people. Among other things, the Pentagon Papers disclosed that the government fully intended to go to Vietnam in spite of President Lyndon B. Johnson’s promises to stay out of the mess that the French had left in that country. In addition, the papers revealed that there was no plan to end the war. On June 14 H. R. Haldeman, White House chief of staff, told President Nixon that out of the “gobbledygook, comes a very clear thing: you can’t trust the government; you can’t believe what they say; and you can’t rely on their judgment. [A]nd the implicit infallibility of presidents, which has been an accepted thing in America, is badly hurt by this.” That summed up the impact of the Pentagon Papers as succinctly as anyone could. In a time of national protest against the U.S. military’s involvement in Vietnam, a time of draft-card burning, protest marches, college laboratory bombings, sit-ins, flower children, and the Age of Aquarius, Nixon’s nose had stretched way beyond Pinocchio’s. Had the government ever told its citizens the truth about anything? Suddenly every conspiracy theory from Roosevelt allowing the attack on Pearl Harbor to the government cover-up of UFOs was given new validity. If even the White House chief of staff admitted that “you can’t trust the government,” why should anyone? The New York Times began publishing excerpts of the Pentagon Papers on June 13. On the evening of June 14 Attorney General John Mitchell warned the Times by telephone and telegram against any further publication. On June 15 the U.S. government won a restraining order against the Times. The Washington Post picked up the cause on June 18 and began publishing excerpts from the Pentagon Papers. That same day, Assistant Attorney General William Rehnquist advised the Post to stop publishing the Papers. The Post refused, and the Justice Department sought an injunction against the newspaper. This time the court refused the government’s request, and the Justice Department appealed. At the same time, the New York Times was appealing the injunction against them. On June 26 the Supreme Court of the United States agreed to combine the cases into New York Times Co. v. U.S. (403 U.S. 713). On June 29 Senator Mike Gravel of Alaska entered 4,100 pages of the Pentagon Papers into the record of his subcommittee on Buildings and Grounds. This portion of the original 7,000 pages was later published in book form by Beacon Press of Boston. On June 30 the Supreme Court made what is arguably the most important decision in U.S. history regarding freedom of the press. By a 6-3 vote, the Court ordered the prior restraints against the newspapers lifted, stating that the government had not met the burden of proof. The justices wrote nine separate opinions, sharply disagreeing on substantive issues. While the decision was an undeniable victory for the First Amendment, these disagreements made some journalists uncertain what protection there would be for future editors and publishers when issues of national security were alleged to be at stake. The publication of the Pentagon Papers strengthened the protests against the war in Vietnam and greatly widened the credibility gap between the American public and the U.S. government. The film revolves around the debate whether to uphold freedom of the press or to protect national security as the US government prevents the media from exposing the Pentagon Papers. But all this is swamped when, on the morning the Post runs a front-page picture of the wedding, it has the pants scooped off it by The New York Times, which has splashed the initial tranche of the Pentagon Papers. The Washington Post's publication of the Pentagon Papers in 1971 has long been a debated decision because of all of the top-secret information that these documents contained, but this film explores that decision and brings it to life for the viewer to see and dissect. How Much Of 'The Post' Movie Was True? Graham agrees with Bradlee that printing the Pentagon Papers might be a good idea, but . When Nixon legally stops The Times from publishing the Pentagon Papers - a damning report suggesting years of official falsehoods about Vietnam - Post reporter Ben Bagdikian (a wry Bob Odenkirk) obtains his own copy. Presidents pushed the country's first female newspaper publisher, Kay Graham (Streep) of The Washington Post and its hard-driving editor, Ben Bradlee (Hanks), to join an unprecedented battle between journalist and government in publishing the Pentagon Papers. In his latest film about the battle by newspapers to publish the leaked Pentagon Papers detailing the US government's misleading portrayal of the Vietnam War, director Steven Spielberg rushed to get the movie shot and released within a year. Prominent whistle blowers whose identities became known--Daniel Ellsberg, Chelsea Manning and Edward Snowden--were charged with espionage for their leaks--even though the Pentagon Papers and NSA data-mining leaks were in the national interest. These became known as the Pentagon Papers, revealing deception that ran across four presidencies and forever altered the way the American public viewed politicians. Secretary of Defense Robert McNamara, knowing the war was unwinnable, ordered up the Pentagon Papers so future researchers could understand the decisions. The book focuses on the whistleblowing practices and regulations in the United States, the United Kingdom, and Australia, including examples like Wikileaks, Watergate, and Daniel Ellesberg and the Pentagon Papers.